If ‘steel is real’, then surely ‘wood must be good’? At least, that’s what US bike firm Renovo is hoping the general public will think about its all-natural, tree-derived cycle frames. The R1 is the cheapest and least arresting of Renovo’s sports bike line-up, costing an actually very reasonable $1,495 (£950) for the frame only. For that you get a genuine US-made product, hand-built out of hickory (with an optional walnut centre stripe), which looks simply amazing. Aside from the visuals, Renovo says wood is light, strong, stiff, long-lasting and provides an ultra-smooth ride. Prices go up to $2,950 (£1,850) for the even more stunning R4 Road frame. But if that’s a bit too rich for your blood, a complete Pandurban laminated bamboo commuting bike is available fitted with a SRAM drivetrain, for $2,450 (£1,550). 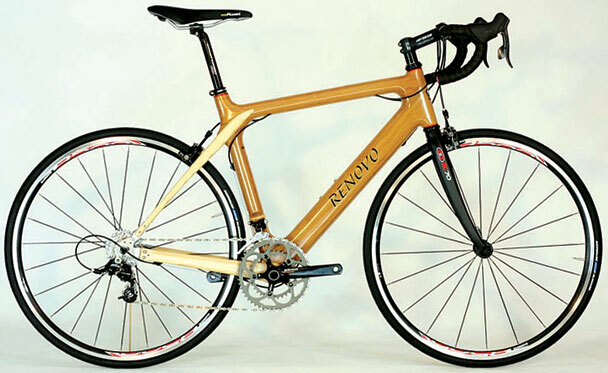 Visit www.renovobikes.com to get wood.